We replace and repair roofing on homes throughout the greater Houston area. We have been a leading roofing contractor in Houston since 1997 and are experienced in all types of roofing materials and projects. We will add or replace any kind of composite or flat roof materials. 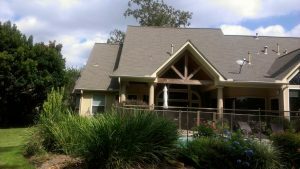 Composite shingles are the most popular in Houston, and are long-lasting and come in a wide variety of styles and colors to fit your personal taste. They are an attractive and budget-friendly roofing solution. Flat roofing is typically a tar or tar-paper composite material, covered in gravel. The tar or composite waterproofs the roof, and the gravel protects the tar from the heat and UV radiation of the sun, preventing it from cracking and otherwise being damaged. A new and popular trend in flat roofing is to install a deck, balcony, or other living space atop the roof. This is great way to expand your usable space, and is an interesting area to relax or entertain. Hurricanes are heavy storms that occur regularly in Houston. Call us if your roof — or any part of your home — has damage caused by a storm or hurricane. We can get it repaired quickly and will work with your insurance as well. Contact us online or call 281-789-4308 for a free estimate or to ask questions about roofing options.